Newly-promoted Corinthians' continued search for recognised name signings has led them to Estudiantes and two-time Italian league winner Juan Sebastian Veron, whom they are keen to bring on board for the 2009 Brazilian Championship. Veron, 33, is out of contract in June of next year and his agent Miguel Pires has told the Brazilian press that he is set to meet with Corinthians president Andres Sanches next week to discuss the possibility of the midfielder joining the Sao Paulo club. "A representative of the Corinthians president phoned me and we arranged a meeting for next week," he told Globo Esporte. 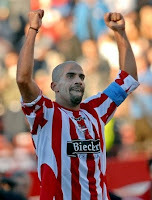 "Verón has a contract with Estudiantes until June, as he wants to play in the Copa Libertadores. Corinthians understand the situation and are still keen for us to meet." Corinthians have been linked with a number of high-profile players since sealing their promotion, including a proposed big-money deal for the currently out of contract Ronaldo, and are desperate to secure a big name ahead of their top flight return.